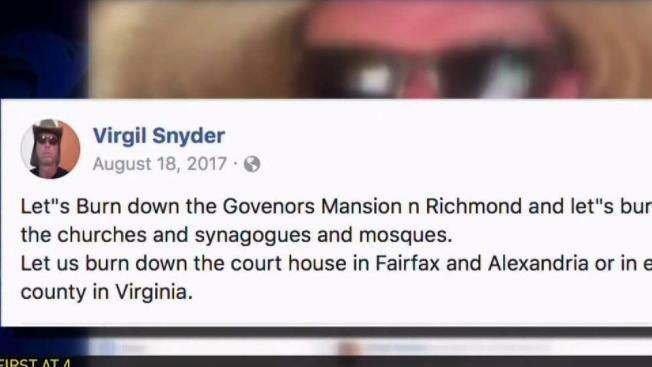 A Fairfax County man is facing felony charges for allegedly making threats against police, local places of worship, courthouses and the Virginia governor's mansion. Virgil Snyder, 46, made the threats by phone and on his Facebook page, search warrants pulled by the News4 Northern Virginia Bureau say. News4 is not identifying the officer involved. A Fairfax County police detective then called Snyder, according to the warrant. Snyder allegedly told the detective he was upset because he said the officer he referenced in his initial call had harassed him previously. The detective said Snyder then hung up the phone. The detective began searching on social media, the warrant says, and discovered disturbing posts on a Facebook account with Snyder’s name. 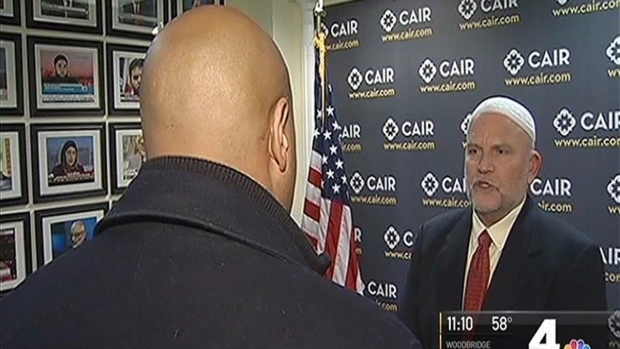 Just a day after several Jewish schools received bomb threats, two Islamic sites in Montgomery County are on high alert after receiving threatening letters. News4’s Shomari Stone reports. Police immediately worked to track down Snyder’s location using his cellphone. They found him the next day, Jan. 3, at the Giant grocery store on the 11200 block of Fairfax Boulevard in Fairfax. It’s there that they arrested him and charged him for making the threats. Snyder did not work for the grocery store, a company representative said. While this alleged threat occurred while Gov. Terry McAuliffe was in office, News4 reached out to the office of new Gov. Ralph Northam. They deferred comment to Virginia State Police, the agency responsible for protecting the governor. A representative for the state police said the department is aware of the situation and is assisting Fairfax County police with the investigation. A representative for the Fairfax County Adult Detention Center said Snyder posted bail on Jan. 4. News4 tried to reach Snyder by phone but did not immediately hear back. Snyder is due in court March 13. Online court records say a public defender will handle his case. A receptionist at the public defender's office told News4 the office could not confirm who will represent Snyder, citing privacy concerns.